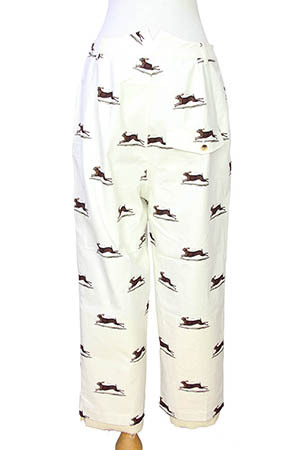 Aleksandr Manamis unisex, off-white, print, single pleat trousers with the 'hare' print. Belt loops. Zip and button fly. waistband with rear v cut-out. 2 side pockets. Single rear pocket with shaped flap and button fastening. Natural coloured calico inset inside at the hem, extending below with raw edging and extend to just below the knee. Fully lined. Wonderful trousers that will go with so many pieces! Size 2 -small - 32 inch waist, size 3 - medium - 34 inch waist.